The creation and maintenance of sites in Bridge is done with WordPress just like our public-facing sites. If you are familiar with updating a site in WordPress already, then you should be able to transfer those skills to Bridge. Note: Do not store any PHI on a bridge website. 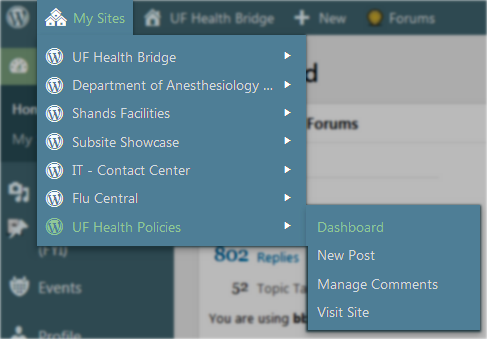 By default, most employees of UF Health and Shands will be logged into their Bridge account based on the credentials they used to login to their work computers. 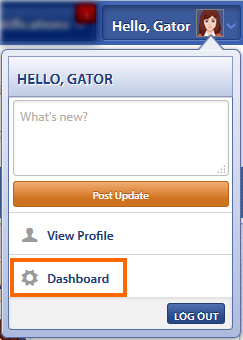 To reach the Dashboard Navigation Menu for your Bridge site, click on the My Account profile in the utility belt and then select Dashboard. To find a site you have user access to, in the Dashboard Navigation Menu, hover your mouse over My Sites and click on the site you wish to edit. To learn more about how to manage and create websites in WordPress, please visit the WordPress tutorials or view the WordPress training options we offer.